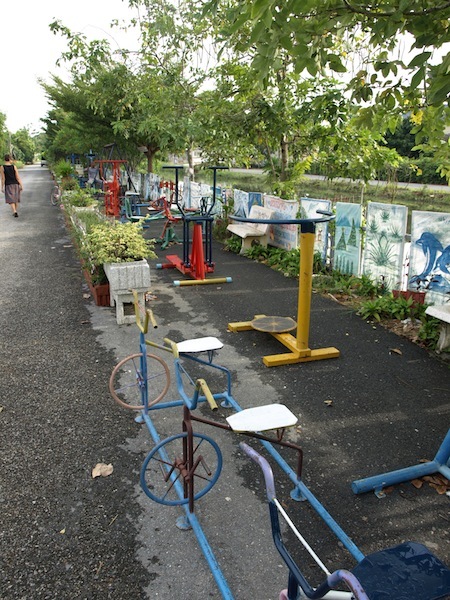 Next to Sirilug’s house there is a canal (klong) and along the bank are heavy-duty exercise machines for adults and children. 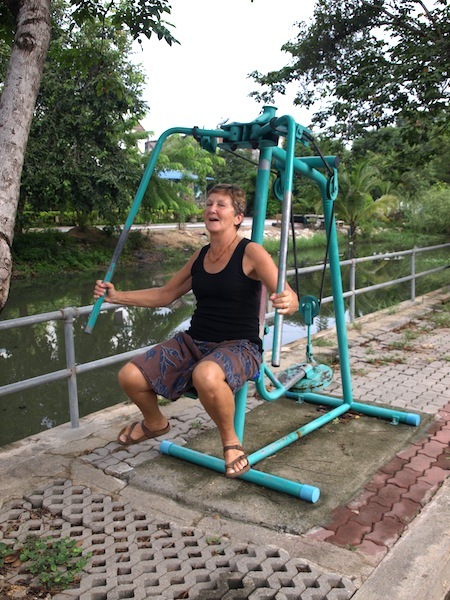 Bev decided to get herself into condition. Klongs in Thailand are not particularly pristine waterways as they are polluted with heavy metals and flotsam. Even so, fishermen cast nets into them with the hope of snagging a fish. I watched one bloke drag his net in (he didn’t want to be photographed) and as he did a black sludge rose to the surface. I would definitely not be eating fish from this waterway. Motorbikes zoomed past and disappeared into a café and on investigation they were actually passing by tables. What I love about this country is the lack of OH & S rules to conform to. Motorbikes going through the café. Bev and I were so amused by this unique event we bought a couple of drinks and sat and watched the motorbikes pass through. 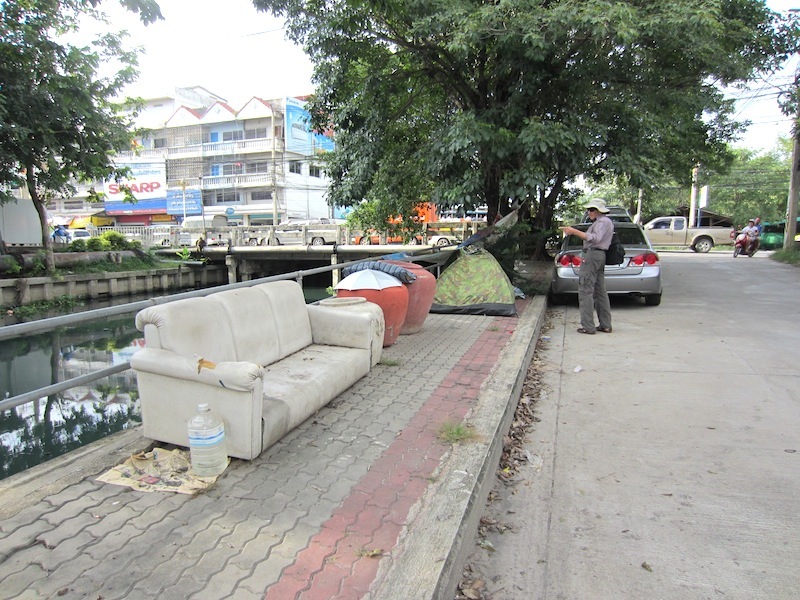 Homeless camp on the edge of the klong. From left to right. What we have here is the camper’s kitchen, lounge room, cupboard (the pots with umbrella lid) and a bedroom (the small tent) and under the tree, an outdoor living area. 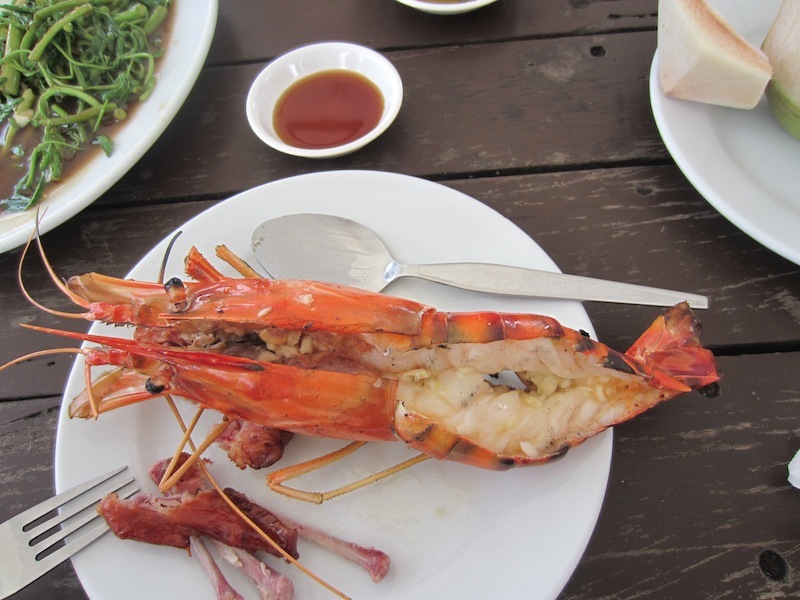 Thailand is not only the land of smiles, but it is a land of contrasts. The homeless setup here is an exception as you do not see a lot of camps like this one. Maybe the camper is an eccentric and he simply wants to live a minimalist lifestyle. A bit public, though! 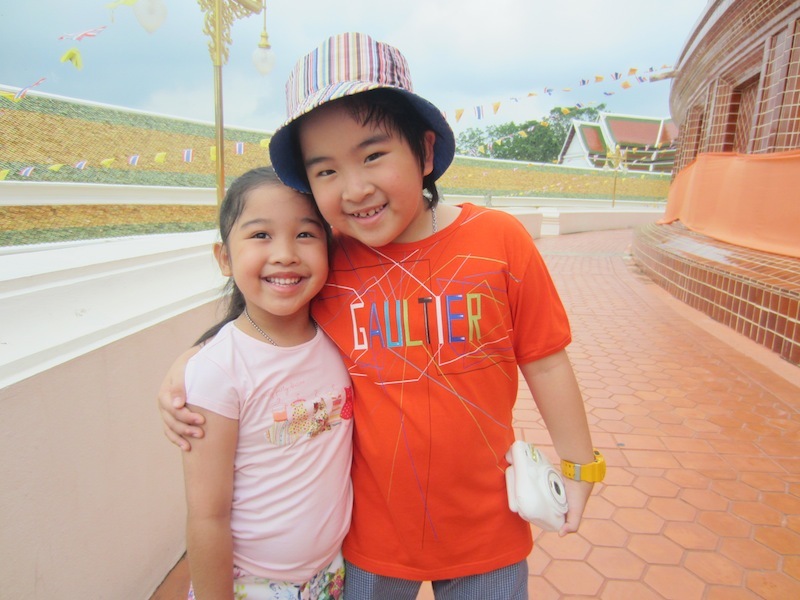 This morning was a big Thai happening Sirilug, Seng and their children took us to the Phra Pathom Chedi (pagoda) which houses the oldest Buddhist structure in Thailand, dating back more than 2000 years. It is said to be the tallest Buddhist monument in the world. 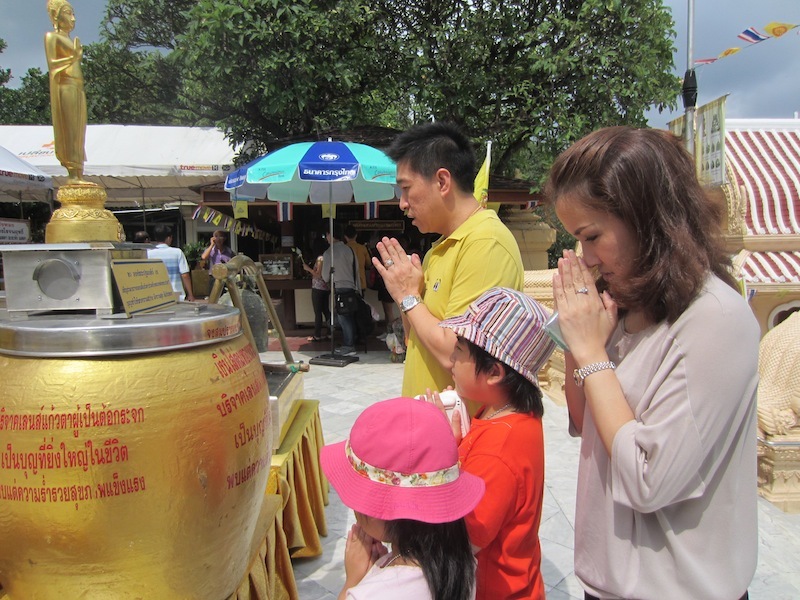 Consequently thousands of pilgrims come from all over Asia to pay their respects and ask for help from the Buddhas. The stupa (the high section) stands 127 metres high and dominates the skyline from every direction. It really is a remarkable structure and when you get up close, you realise just how big it is. What we see today is not the first one built on the site. The first was mentioned in 4th century Buddhist scriptures. Over the years stupas here have been built on top of each other with influences from India, Cambodia, China and Thailand. The main entrance to the Phra Pathom Chedi. 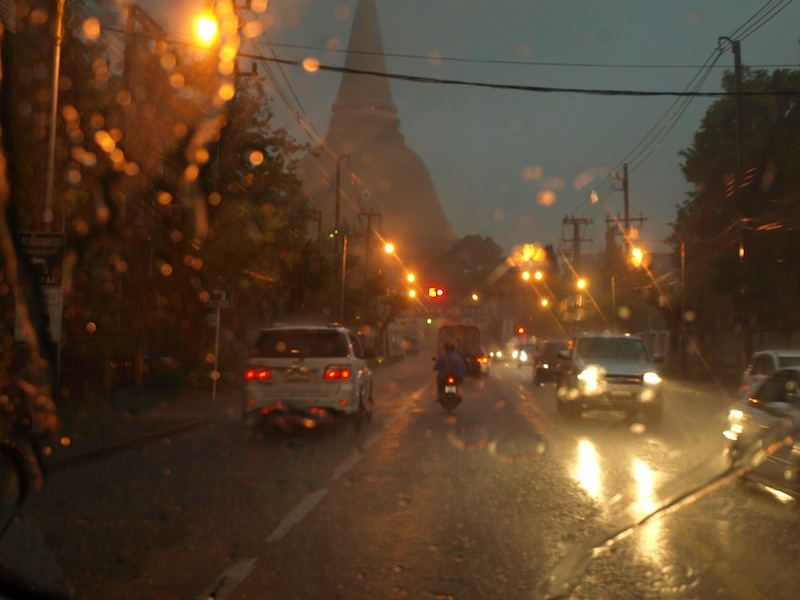 Chedi on a wet night. One of the questions I put to Sirilug was who instigated the building of the stupa here? The answer is, as you would expect, not simple but I fathomed that, ‘Once upon a time Phya Kong who ruled over the district had a son who astrologers predicted would one day kill him, so to eliminate the threat he abandoned his son by the roadside hoping the child would die. However unbeknown to Phya Kong (I keep thinking King Kong) an old woman out of pity took the child into her home and raised him to adulthood. At some point the son killed Phya Kong, because he thought Phya Kong was an oppressor of the people. Only after he killed him did the son find out that it was his father and then, because he was feeling angry that he had killed his father, he killed the old woman who raised him. He must have thought she should have told him who his father was. After he killed the old woman remorse and guilt set in and to relieve his guilt he consulted the local monks hoping they could advise him how to allay his guilty feelings. The monks said the only way to rid himself of the guilt was to build a pagoda as high as the doves fly. And that’s how the stupa came into being. In case you are wondering when this was happening, it was back 193BC. 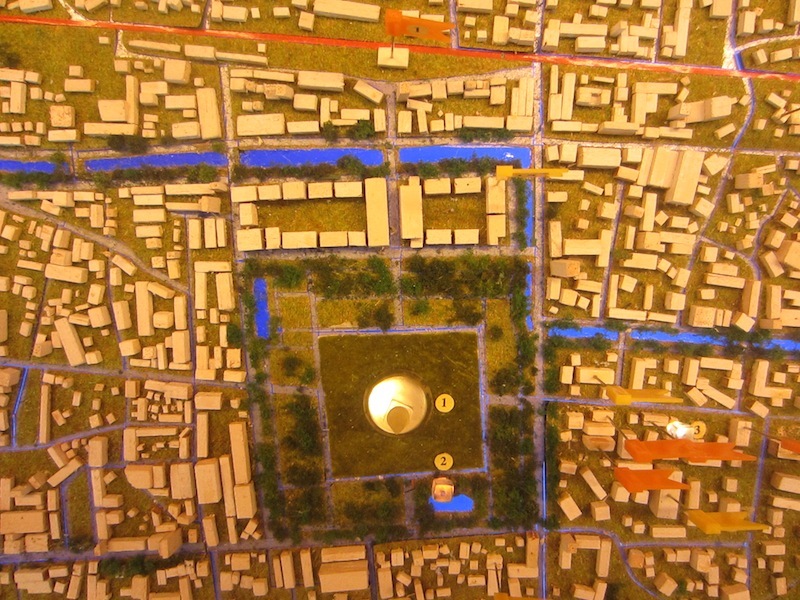 Model of the area around the Phra Pathom Chedi. 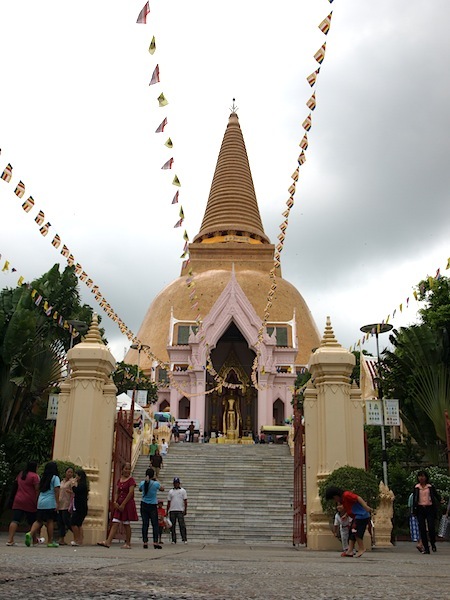 The Phra Pathom Chedi is the golden circle marked 1. 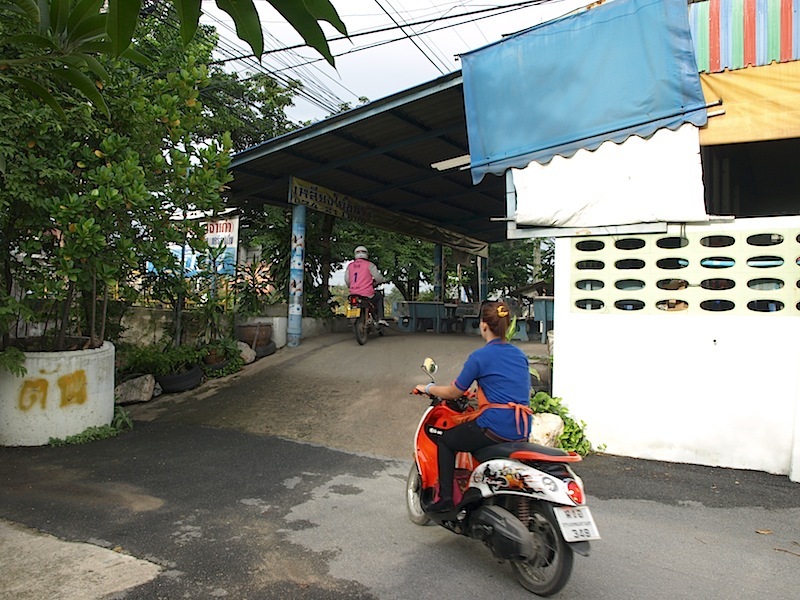 The blue line is is a klong. Sirilug, Seng, Peak and Pye praying and offering thanks to Buddha. I didn’t ask what the subject of their prayers was, but I guess that they may have asked the Buddha to watch over us during our odyssey. 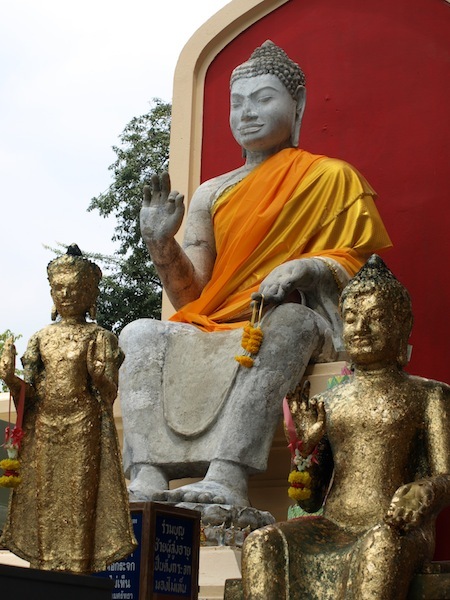 Buddhism is not a religion as there is no god, nor is it a cult; it’s a philosophy and not a bad one at that. I have to admit that I don’t understand the symbolism associated with Buddhism but what I do know is it is generally a good set of rules to live by. On our property we have a small cottage, which we call Asoka’s Shack. Asoka was an Indian general who was marauding the country, killing and plundering. One day he somehow decided there had to be a better way to live and he turned to Buddhism. He instructed his army to lay down their arms and plant roadside trees under which travellers could rest, provide water and build shelters for weary travellers. Our shack is one such shelter and behind the door there is a sign telling this story. Many a traveller who has stayed in the shack say it was the best place they have stayed in. One couple who stayed were Rolf and Erika, who were riding their bikes around the world. We will be staying with them when in Switzerland on this odyssey. This stone Buddha is very ancient, thought to be more than 2000 years old. Note the Buddhas to the left and right. They are not painted gold, the colour you see is layer upon layer of gold leaf. Pilgrims buy a packet of leaf and stick it to the Buddha of their choice. 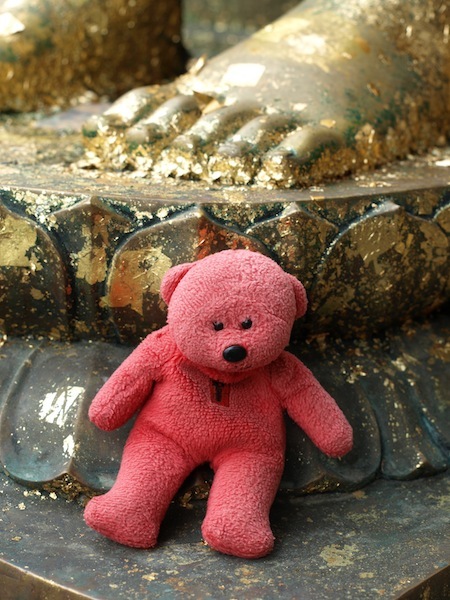 T Bear at the feet of the ancient Buddha. 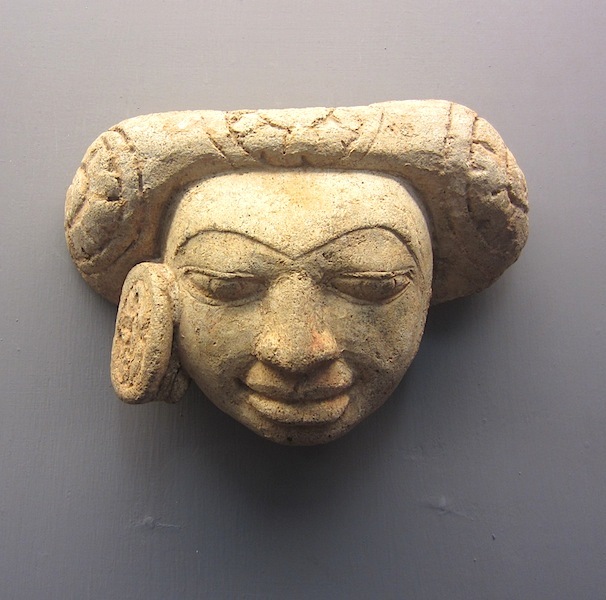 A beautiful ancient Indian artefact found near the Chedi. There were a number of these serene sculptures in the museum next to the Chedi. When we return home I’m going to make some of them in clay. 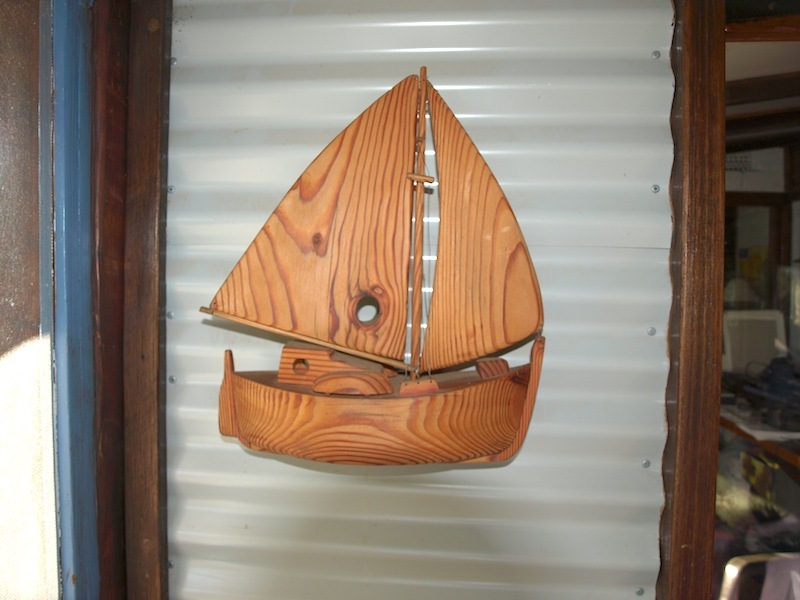 At times when on the road I sometimes think I can’t wait to get home and manipulate clay and create in wood. I did take photographs of T Bear in the hands of a Buddha but afterwards found out it was disrespectful of me to do so. Also of interest there were flowers that looked like marigolds placed as offerings around the stupa. Bev smelt one but was informed that sniffing the offerings was also disrespectful. However foreigners like us are forgiven as we don’t understand the protocols. 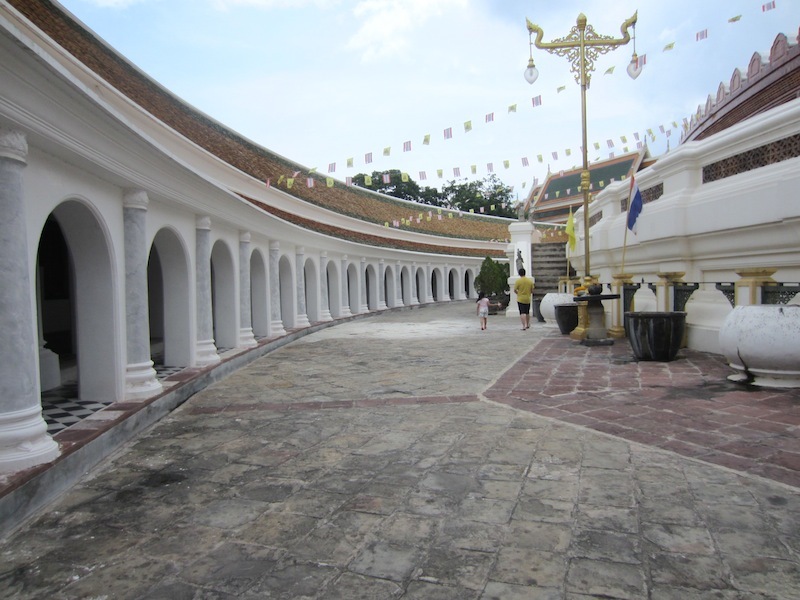 Monks’ quarters at Phra Pathom Chedi. 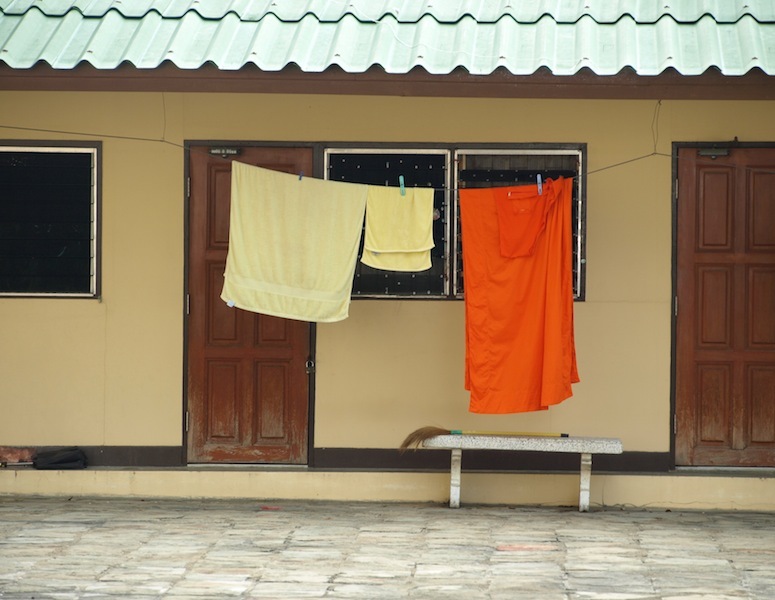 The two towels, broom and the saffron robe are probably all this resident monk owns. I’m not sure I want to be as minimalist as this. One of the hundreds of monk statues at the pagoda. Each of the monks has a specific attribute such as wealth, health, longevity and you pray to whatever one you need help or guidance from. 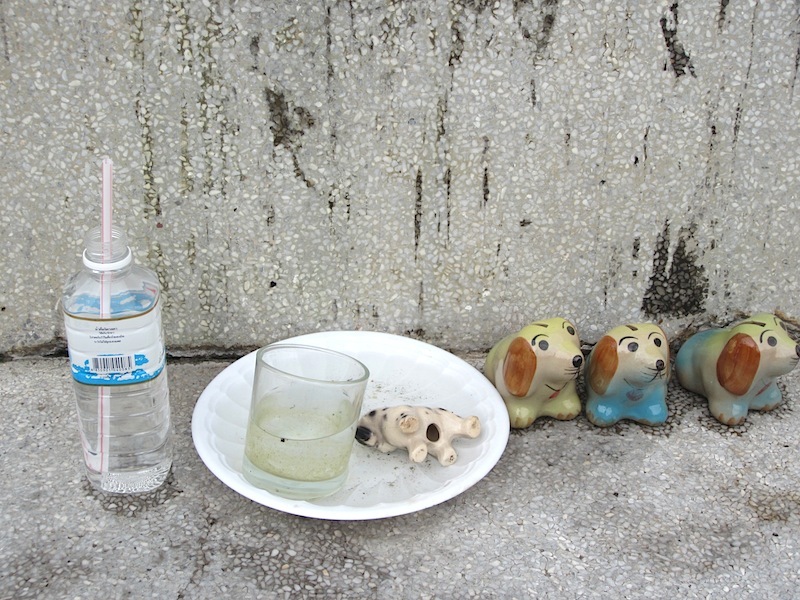 Sirilug’s family gave Bev and I a small Buddha each (the one dedicated to safe travel) to take with us on our odyssey. Before presenting them to us they clasped them in their hands, blessed them and touched our Buddhas with one they wore around their neck. I thought this making contact was a linking, our Buddha and theirs being part of the giant jigsaw puzzle of life. The linking joins us with friends of theirs in this jigsaw. The outer perimeter of the pagoda. In each one of these alcoves is a Buddha statue. I estimated there were well in excess of two hundred. Inner wall of the temple. If you have laid bathroom or kitchen floor tiles lately you have probably used tiles made in Thailand. 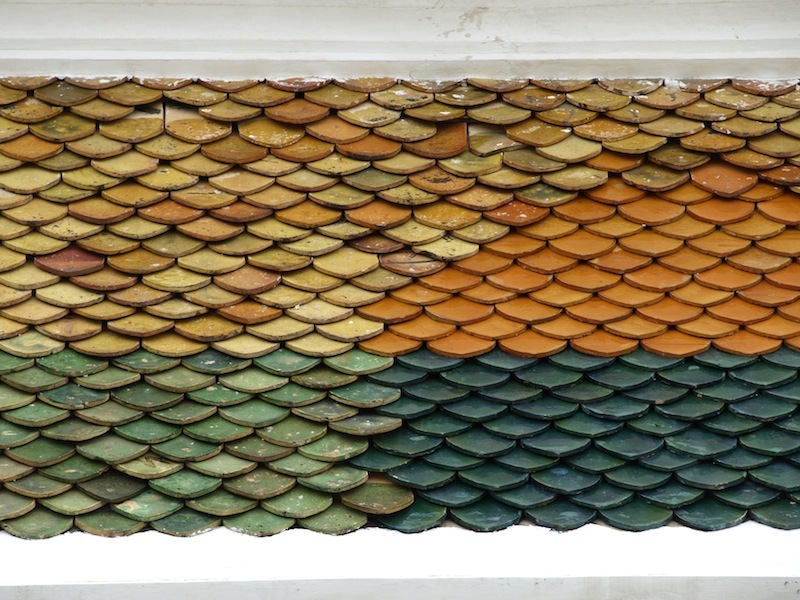 The Thais are experts when it comes to tile making because they have been at it for thousands of years. The wall here and the roof of this temple are glazed tiles. 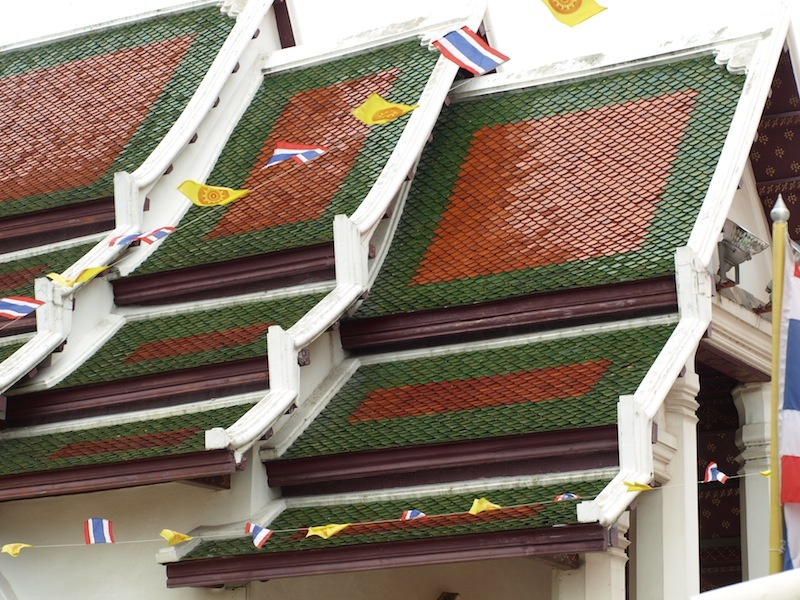 At present there are thirty-two tile factories in Thailand making and exporting tiles to countries all over the world. Each tile has a lug on the underside and is individually wired to purlins underneath. Sorry to dwell on tiles but I love the shapes, colours and the warmth of every one. AFTERNOON OF SATURDAY 15TH SEPTEMBER. 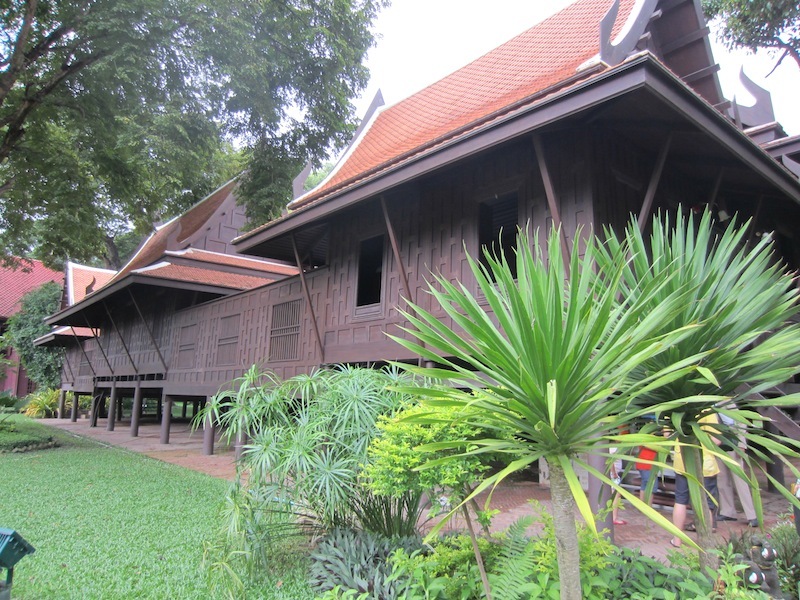 After the visit to the Phra Pathom Chedi we were taken to a the Sanam Chandra Palace nearby, a summer palace built by Rama 6. 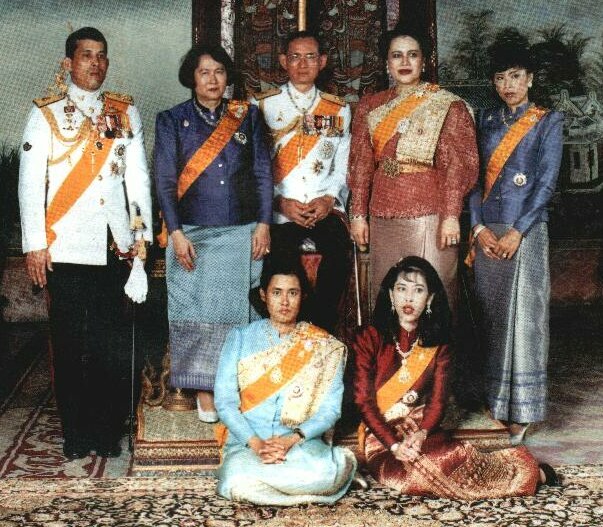 I have to tell you I’m a bit confused when it comes to who’s who and when each king ruled Thailand. What I can tell you is that a very big proportion of the Thais revere and respect their present King, Rama 9, with gusto. Major infrastructure projects in the country are named after past kings or the present king. 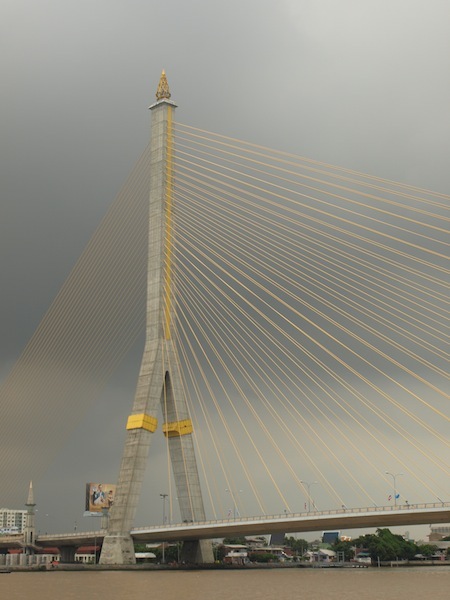 King Rama 5 bridge in Bangkok. The bridge photograph was taken from a floating restaurant in Bangkok where Sirilug and Seng took us for a special meal. 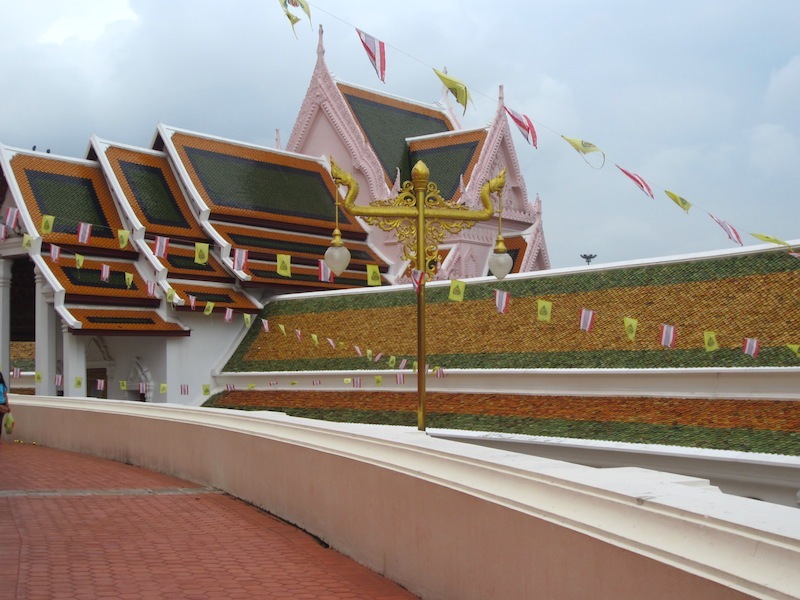 Getting back to the palace, it appears that King Vajiravudh (Rama 6) visited the Phra Pathom Chedi and he was so taken by the tranquillity and spirituality of the area he decided to build himself a summer palace nearby. Having studied and lived in England he considered himself a true English gentleman and his choice of styles of architecture for the buildings depicts this leaning. There are influenes of French, English and tropical styles. Our mode of transport around the grounds of the palace. 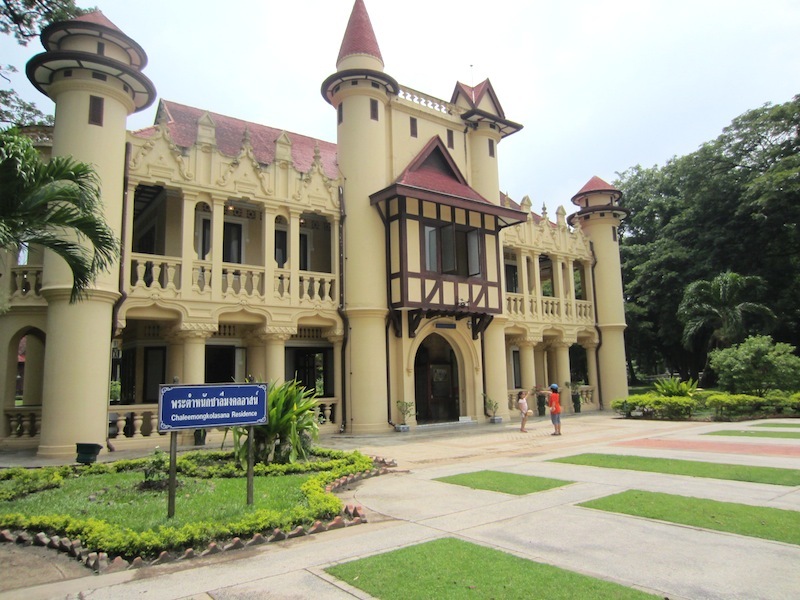 One of the buildings in the Sanam Chandra Palace complex. This tiny castle-like hall built in a combination of French Renaissance and English half-timber style was built around 1908. Upstairs is a bedchamber, a study and a bathroom. Downstairs is a waiting room. 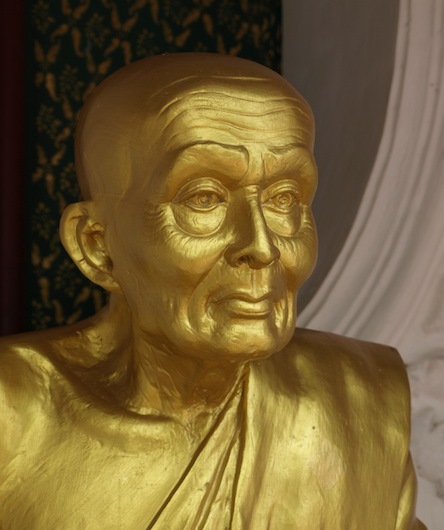 Bronze statue of Ya Le at front of palace. 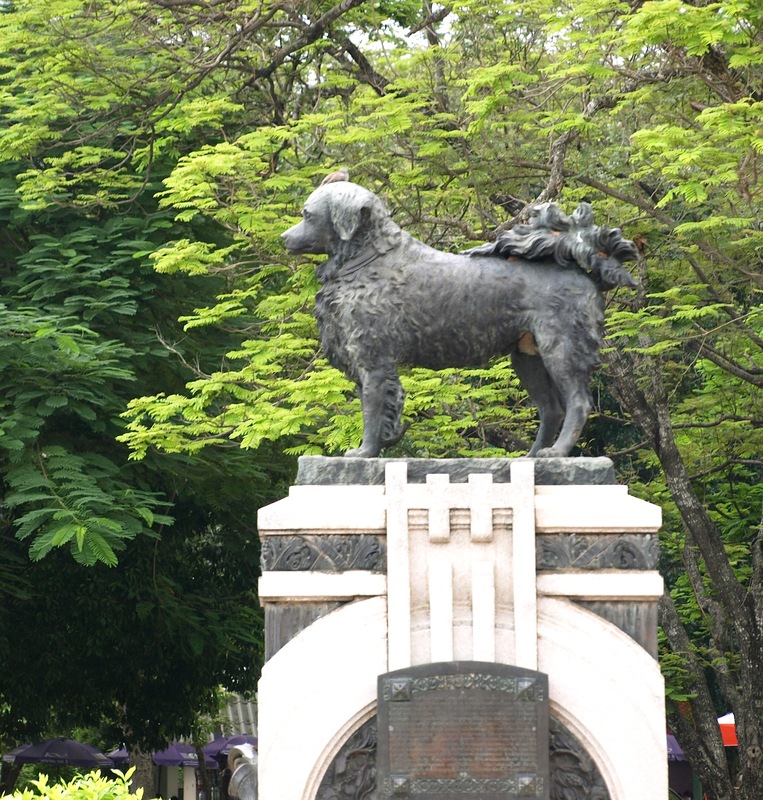 Ya Le the dog was born in the Nakom Pathom jailhouse and when the king was visiting he spotted the puppy and commented on its cuteness. The comment didn’t go unheeded as later the head jailer presented the puppy to the king. The dog became a constant companion and the king and being a bit of a dramatist the king named the dog after the leading character in one of his favourite plays. One night Ya Le escaped from the palace grounds and got into a fight with other dogs. One of the Royal Guards shot at the fighting dogs and killed Ya Le, not knowing he was involved. The king was devastated so he had a statue made and erected at the front of the palace. Offerings to the spirit of Ya Le. Ya Le’s spirit has water, food and a couple of mates to frolic with. One of the buildings in the palace grounds is the Thub Residence. It is a traditional housing complex which comprises eight houses radiating out from the main building. The living area is open to the elements on one side. We were held up on one of the verandas for over an hour due to heavy rain. Unfortunately our cameras had been confiscated and thus no photographs, which was a shame as the reflected and deflected water running off the roofs onto the smooth teak decking would have made some dramatic shots. 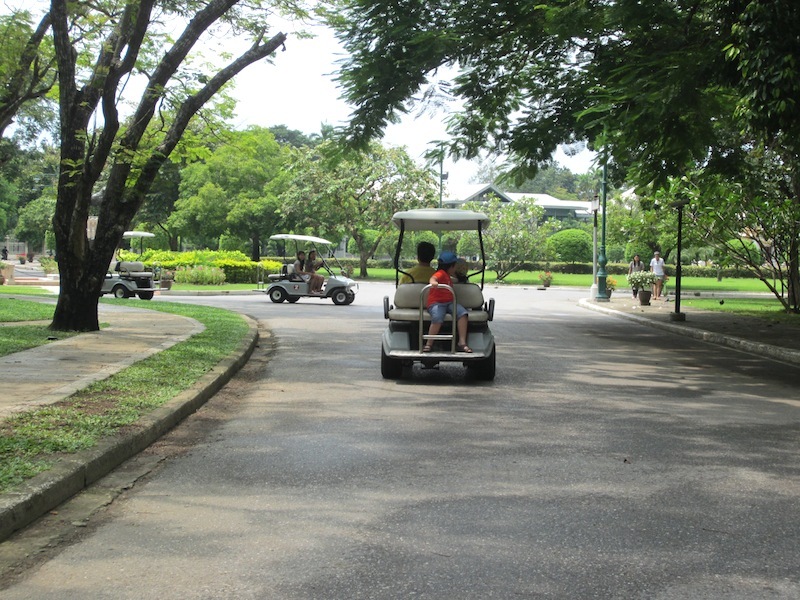 Finally the rain eased and we paddled off to our golf buggies, drove to the car and headed home after another Thai day. Tomorrow we are being taken the Grand Palace and the Temple of the Emerald Buddha in Bangkok and from all reports it is going to be something.